Save the Rhino Trust Namibia operates in the harsh northwestern corner of Namibia, protecting the world’s last population of free-roaming black rhinos. Their range covers over 1 million hectares, completely unfenced and with no national park status. SRT Rangers spend shifts of up to 21 days at a time working in this desert landscape, often walking more than 45 kilometers a day. 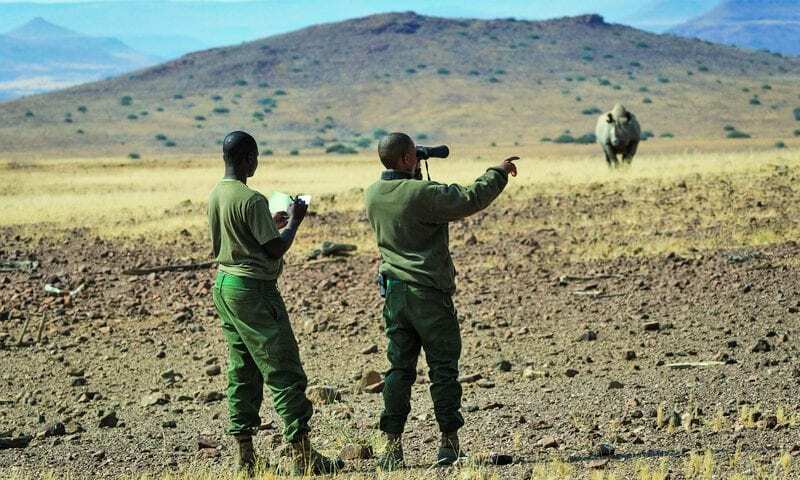 By tracking and monitoring Namibia’s black rhino population, they help curb the threat of poaching and ensure a future for the largest stronghold of black rhino in the world. 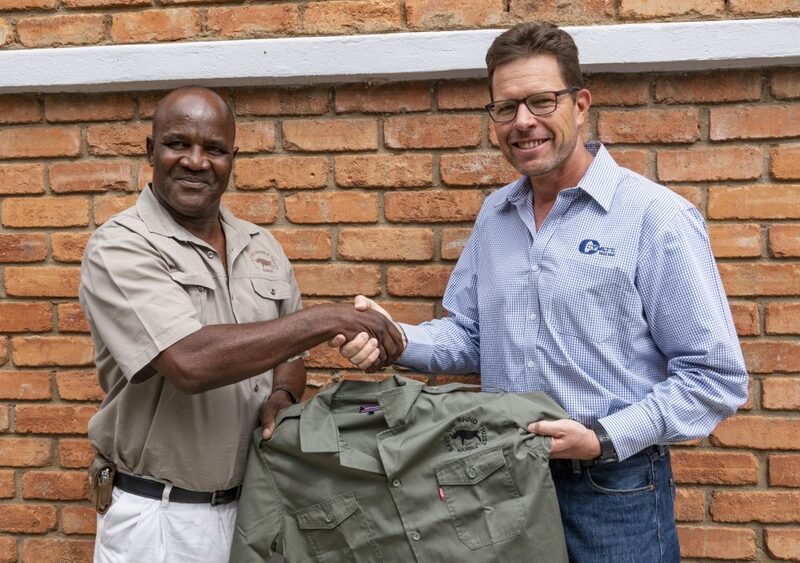 At a hand-over event at the Venture Media offices in Windhoek, CEO of CYMOT Namibia, Axel Theissen, presented the CEO of Save the Rhino Trust (SRT) Namibia, Simson Uri-Khob, with a complete set of new tactical workwear for the SRT rangers. The kit, produced by Jonsson Workwear, includes Combat Workshirts, Cotton T-shirts, Cargo Trousers and Cargo Shorts, to the value of more than N$30 000, for each ranger employed by SRT. The tough and durable kit by Jonsson Workwear will better equip them for the difficult tasks at hand. At the event, SRT CEO Simson Uri-Khob thanked CYMOT for its on-going support throughout the years. “Every bit counts,” said Uri-Khob. He went on to emphasise the importance and value that official uniforms such as these can add to the pride his rangers feel for the job. He states that uniforms ensure that his rangers are cognisant of their duties, show respect toward the public and have pride in SRT. Along with RMB Namibia and Wilderness Safaris, CYMOT is one of the main sponsors of the annual RMB Namibia Ride for Rhinos event. The event, which will this year take place from 17 – 21 July, takes 20 mountain-bike and conservation enthusiasts on a 4-day cycling safari through the rugged Damaraland wilderness, where these adventurers are accompanied by SRT Rangers and learn first-hand how daunting the task of protecting Namibia’s rhinos is. 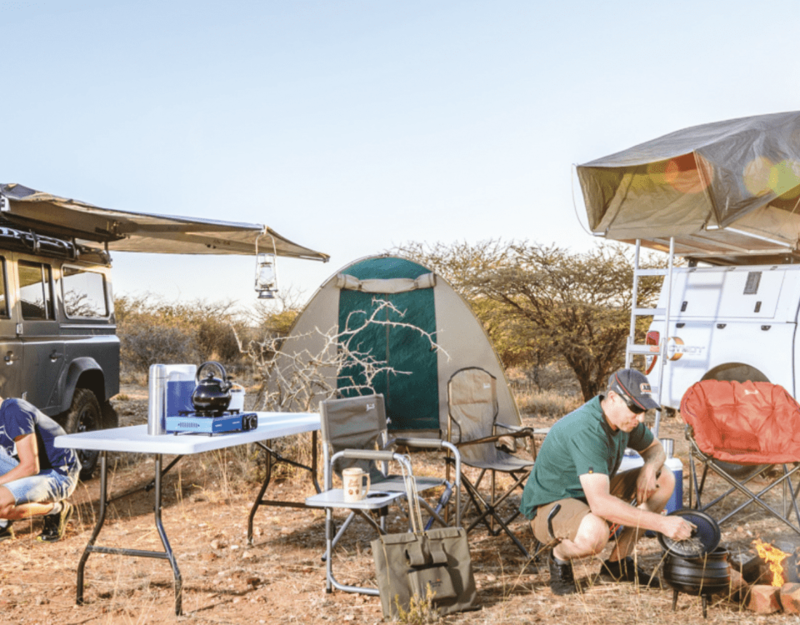 The event, which has been sponsored by RMB Namibia, CYMOT and Wilderness Safaris since its inception in 2015, was conceptualised and is organised by Venture Media, the country’s largest content creation and tourism and conservation marketing company. Venture publishes such magazines as Travel News Namibia, Conservation and the Environment in Namibia, Namibia Holiday & Travel and the Namibia Trade Directory. The RMB Namibia Ride for Rhinos has in the last 4 years raised over N$ 1,8 million in funds and products for SRT, with support also being given to IRDNC and, as of this year, Children in the Wilderness. To learn more about Save the Rhino Trust and how you too can support their cause visit http://www.savetherhinotrust.org.